It will probably please you to find out that things don't always go according to plan for professionals, despite the impression we give in magazine articles and at demos. This month has been a funny one, firstly because it has been rather quiet on the turning front but also because the most interesting job, which I will describe in more detail later, went wrong from the start and continued to challenge me throughout. This series is a warts and all diary and I will recount to you all of the disasters, as well as the triumphs, that I encounter each month. I have been fully self employed since June 2010, having built my business up over the four previous years. I have been fortunate to have been kept busy throughout this period. This month has been the first I have experienced when things have just gone very quiet. Short periods of respite can be nice, allowing me to catch up on things that may have been put aside or on the 'to do' list, but once these have been done, what then? There is only so much cleaning up I can do! Well, I try to keep my options open. My main income is from my turning work which is all commission based, then there are the demos I do at clubs but these are booked up to a year in advance and I have little control over when they fall, apart from having a choice of two or three dates for some of them. 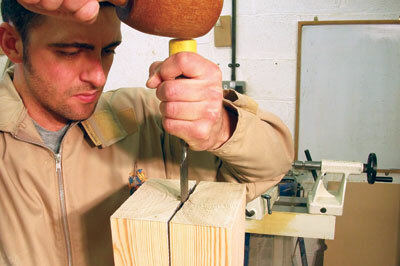 I also sell a range of woodturning supplies, including finishes and abrasives; this brings in a small but steady income and also has the advantage of supplying me with my finishes and abrasives at cost price, which reduces my overheads. I offer one-to-one tuition in my workshop which generates a few day' work each year, but again, this is at the whim of potential students as to if and when they might want a lesson, and in my experience, it is always when I am most busy and not at these quiet times! 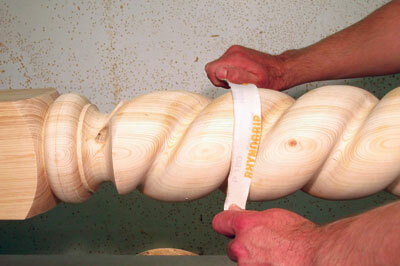 Then of course there are my articles for Woodturning which pay a small - Editor take note! - but regular income. The other occasional source of income is through non-turning woodworking jobs. I trained as a joiner and have set my workshop up in such a way that I can undertake some small-scale woodwork and this month that is what I have done. From time to time I am asked if I can make 'such and such' or 'X, Y or Z' and usually I say, "Sorry, it's not really the sort of work I do..." unless I fancy a change or the challenge of a particular job that is, A change is as good as a rest. 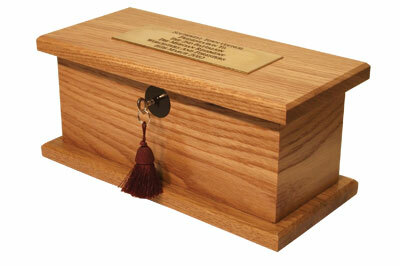 Around a year ago I had made a CD storage box for a client in oak (Quercus robur); it was to hold 18 CDs of photographs - one for each year - taken over the lifetime of his son and given as a birthday present. He was so pleased with it that he asked if I would make two more, one for his daughter for 20 CDs and another with 40 CDs. There was no immediate rush as the birthdays were not for a year or two, so I had put them on the back burner until I got quiet, so I made them. Again, he was very pleased with the outcome and this job kept me busy for a few days. 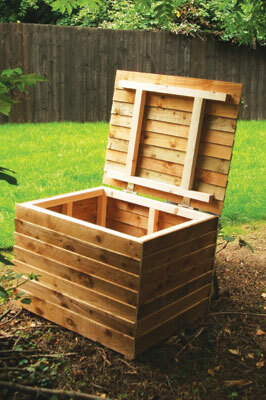 Another customer came to me and asked if I would make a garden storage box for him, to store firewood for his terracotta garden heater and perhaps to double as a seat, so I did. Another day filled. Once I had delivered that, he asked if I would make him an oak swing seat - he had the rope but no seat - so I obliged. I was then approached by a Parish councillor from a small town in Nottinghamshire who had seen the picture of the original CD box on my website and wanted something similar to hold a scroll which was to be given in a presentation ceremony. Once again, I made it and it filled a couple more days for me. 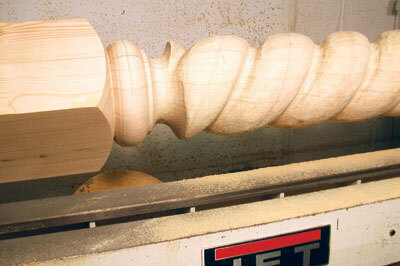 When a turning job finally did come in it was an absolute gift to someone like me who is writing a magazine article and needs to fill pages with interesting turning jobs. It was described as a 'canopy post,' which I took to mean it would be fitted to a house each side of a doorway and appear to support a porch canopy. Made in softwood, it was to feature a barley twist, be split turned and, to top it all off, it was 1500mm (59in) long and 150mm (6in) square. Things started to go wrong from the start when I put in my price. Quoting for jobs in itself is a pretty simple equation: (Timber + profit margin) + (hourly rate x estimated time taken) = quote. The difficulty comes in knowing how long a particular job will take. I have cut a lot of barley twists so have some experience with how long it takes; what I hadn't bargained for was how much longer it takes to cut a twist in 150mm (6in) material, even softwood, compared to a twist in 75mm (3in) timber. 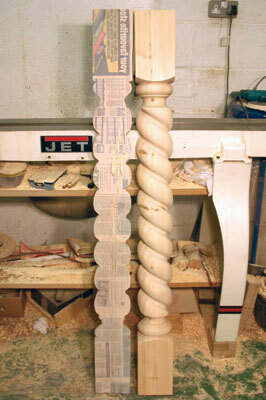 My last barley twist job had been 22 stair spindles, made from 75mm (3in) oak. These had a single tapering twist and by the time I had cut that many I had it down to 45 minutes each. Based on this information I quoted for a day's work to cut the twist, it ended up taking me nearer two, but that wasn't all that went wrong! 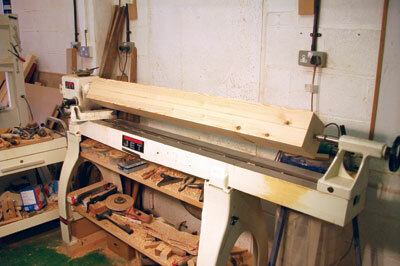 The main difference between a professional and an enthusiast, I think, is that when things go wrong for an enthusiast they can chuck their tool and/or timber in the corner of the workshop and walk away in disgust, possibly returning a day or two later with fresh eyes to look again at the project. As a professional I don't have that luxury. This job had a deadline and so, no matter what happened I had to get it done by the date. By the time I had ordered in the timber, prepared it and glued it up I had three days before I needed to have it on the carrier and off to its new home in Birmingham. 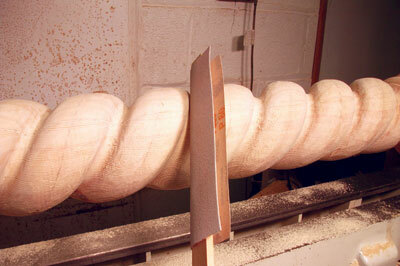 With the wood prepared, I mounted it on the lathe. 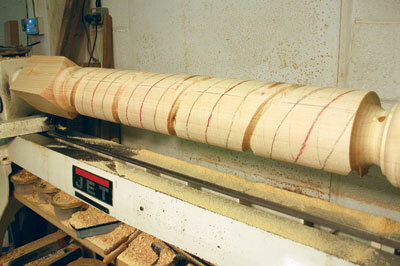 Once again, my Jet lathe was used to its full capacity. I started off slowly, making sure the glue and paper joint for the split turning was holding OK. Once I was happy I could turn up the speed, within the limits of my machine. I cut the pommels with my 12mm (1/2in) spindle gouge and turned the centre section round, I then marked out for the twist. Barley twists are not difficult, they are just hard work. I marked it up for a double twist which is my preferred style and began cutting it. There are few 'rules of thumb' about cutting barley twists which are outlined in the handy hints panel opposite. As I cut the twist it quickly became clear that this was going to take much longer than planned and then, just as I cut the two valleys down to about 25mm (1in) deep my Microplane rasp snapped! I use a combination of a large round and large square tools and it was my square one that snapped at the handle. I quickly ordered another in the hope that it would arrive early the next day but in my mind I knew it was really too late in the day to get it in time. I did as much as I could with my remaining tools and went home with my fingers crossed that it would arrive in the morning. It didn't so I had to do the best I could with the round tool, my other rasps and finally with abrasives. It came out well and overall, I was pleased with the result but I can't help feeling that the valleys are a bit too rounded and the broken tool would have sorted that out for me. With the twist cut it was time to see how the glue joint would work. During the job it had opened a little but it had plenty of gluing area so I was confident it would hold. I started off with a chisel in the joint and some firm raps with a mallet - this opened it up a little - I then progressed onto my wedge shaped axe which split the two halves apart with ease. A quick sand of the edges and the job was ready to pack up and send off, just in time! I heard from the customer a few days later and he was very pleased with the job.